WHEELING, W.Va., Nov. 28, 2015 /Christian Newswire/ -- Dec. 5th at 6:30pm The Dynamic Duo of Christian Music, ( our Local boys), the Chrisagis Brothers who have become Internationally known and loved will be doing a Christmas Concert with a True Legend, 5 time Grammy Award winner and 12 time Dove Award Winner Russ Taff. Joining in on the fun will also be the internationally loved Bill Gaither Homecoming's own Angela Primm. This concert will be held at The Ohio Valley Christian Center in Wheeling, WV. The Chrisagis Brothers are excited to work with Russ who has been an inspiration since they were kids. Russ contacted the brothers several months back to be a part of "The Legends Concert" which was a brainstorm of the Brothers. After checking the date and trying to reschedule his concerts Russ came up with doing a Christmas booking with the Brothers instead. This will be a night you don't want to miss and the Christmas concert of the year. Russ will be singing songs from his hit Gold Records like "We Will Stand," "Praise the Lord," and others along with some Christmas songs from his Christmas CD's in Classic Crooner Style. Russ has had an incredible journey he started as a Pastor's son who sang in churches. He became an overnight success when he joined The Imperials in the 70's. He won three Grammy's while with them and then went on to a successful award winning solo career raking in two more Grammy awards and four more Dove awards for male vocalist and best albums. He released popular albums like: "Walls of Glass," "Medals," "Russ Taff," "Winds of Change," "The Way Home," "A Christmas Song," "Under Their Influence," "Right Here Right Now," "Now More Than Ever," "Another Sentimental Christmas," & "Faroe Islands." Russ is a song writer and has been part of The Bill Gaither Homecoming Shows. He has sung with the Gaither Vocal Bands for the last few years. He has been nominated for two more Dove Awards while singing with the Gaither's. He is in the Gospel Music Hall of Fame and has won every title in Christian Music except Female Vocalist. 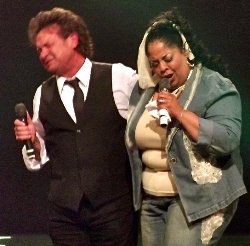 The Chrisagis Brothers have become good friends with many legends and some top notch Christian Recording Artists like Angela Primm who not only is one of Bill Gaither's #1 Female Vocalists but also has her own ministry. She has sung with Christian Greats like Andre Crouch, Russ Taff, Rascal Flatts, Sandi Patty, Patti Austin, and Jason Crabb. She has five albums and has traveled with Bob Farrell's Oratorio "Savior." The Chrisagis Brothers have been working with Angela on several books and merchandise for Angela's ministry. Angela just recorded a duet with Shawn Chrisagis "Only Always" a song that sounds like a Nat King Cole and Natalie Cole song, on the Chrisagis Brothers new Christmas CD entitled "I Believe in Christmas" and will be singing it at the concert as one of the Highlights of the night. The other highlight of the night is when Russ Taff takes the stage and sings a duet with Brian Chrisagis to one of Russ' hit songs "I'm Forgiven." The Chrisagis Brothers have just released a new Christmas CD and just got back from the AMG Heritage Awards where they were nominated for four awards and have been nominated for the last four years. They will be singing songs from their new CD as well. Other songs at concert will be: "Go Tell It On The Mountain" by Russ Taff, "Sweet Little Jesus Boy," "Jesus What A Wonderful Child" by Angela Primm, and "Wise Men Still Seek Him," "A Shepherd's Prayer" ( Move Me Closer), & "Lord, Let This Be A White Christmas" by Chrisagis Brothers. The Concert is at The Ohio Valley Christian Center in Wheeling, WV. Come early doors open at 5:30pm and concert starts at 6:30pm. Seating is limited, there is a $10 donation at door. For more info log onto Chrisagis Brothers or call Lynda Sullivan at Chrisagis Brothers office: 740-859-2344.